“Ride on the Open Air Elevated” commands the side of this Sixth Avenue El station—an attempt to lure New Yorkers away from the IND underground. 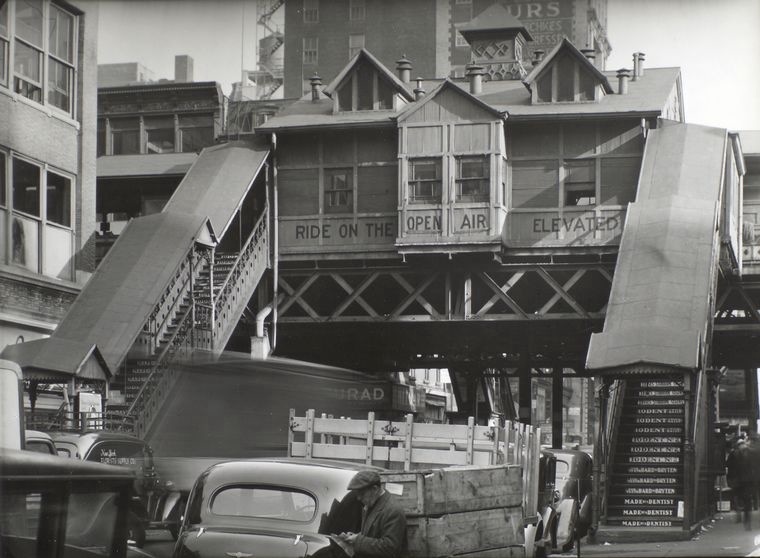 Berenice Abbott took this photo in November 1938. The 28th Street station had already closed and was slated for demolition, notes Changing New York, as was the entire Sixth Avenue elevated line . . . and eventually all the els across the city. 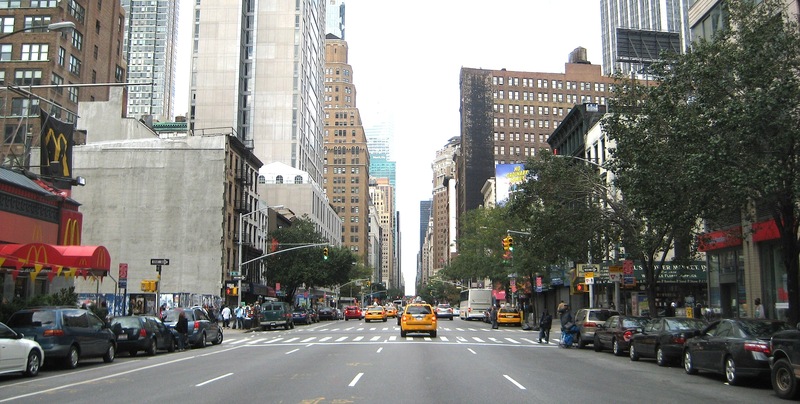 Here’s the same view up Sixth Avenue today. This stretch, center of the shrinking flower district, is open and appears wider and brighter. Nothing from the 1938 photo looks similar, except the decorative border around the building on the left that’s now a McDonald’s. Could it be the same building with the top floors sheared off? Possibly; back then, this McDonald’s was a Child’s restaurant. 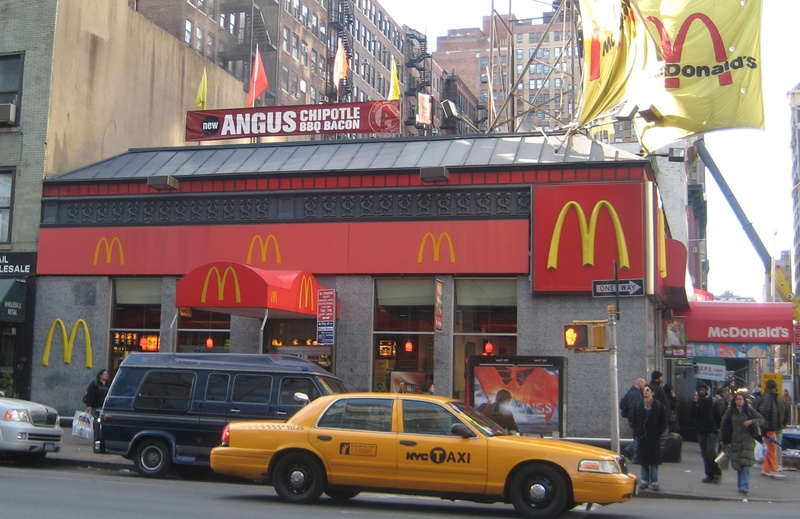 The McDonald’s franchise on Sixth Avenue and 28th Street appears to be a typical unremarkable fast-food building on the edge of Manhattan’s ever-shrinking Flower District. But if you look closely at the building, you can see an unusual motif that wraps its way all around the structure: pairs of intertwined seahorses framing a trident. 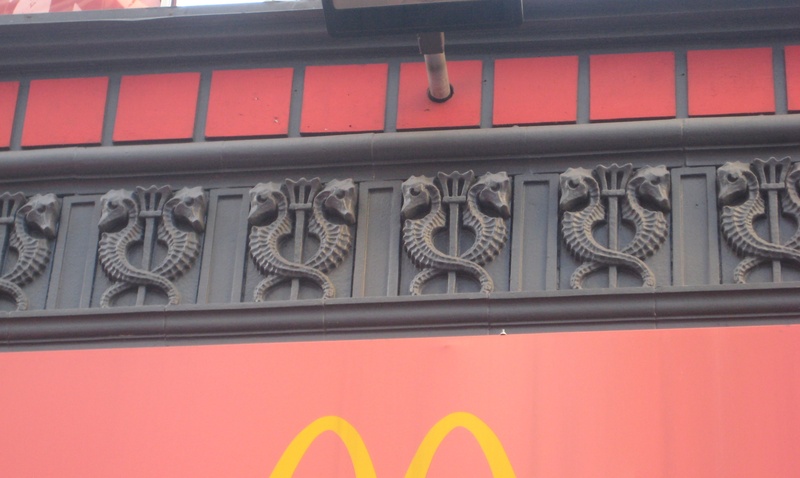 The sea-creature motif exists because the building originally housed a Child’s restaurant—part of a chain of eateries the dotted New York City in the first half of the 20th century, like Schrafft’s and Horn and Hardart’s Automat. Not all Child’s restaurants had this logo; the famous one on the Coney Island Boardwalk, landmarked in 2003 and now Dreamland Roller Rink, features colorful terra cotta fish, seashells, ships, and King Neptune. What’s on the menu at Child’s? The Child’s restaurant chain started with one lower Manhattan “lunchroom” in 1898, eventually building up to dozens of locations around New York City and other Northeastern cities. 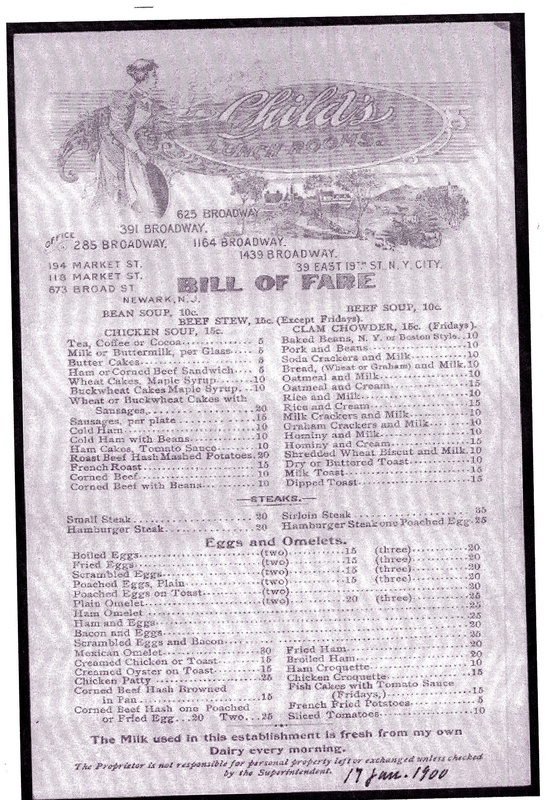 This 1900 “bill of fare” features lots of forgotten foodstuffs. Mmm, butter cakes and creamed oyster on toast! 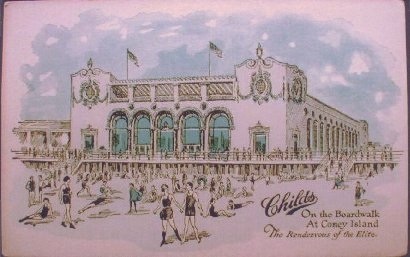 A former Child’s, built in 1923 on the Coney Island Boardwalk, was granted landmark status in 2003. What’s happening to the building now? It’s the Dreamland Roller Rink and should be open weekends starting July 19.